(Naked into the wilderness #9b) This video takes you through one hour of non-stop flake removal to show how the secret of making an arrowhead is not so secret. 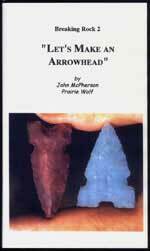 Step-by-step, flake-by-flake, the mystery is removed and science prevails as the author, making two arrowheads, shows how to overcome various obstacles. Running time: 60 minutes.